Clearly, there’s more to the Glendale bike death wrist slap than there appeared last week. According to the Glendale News Press, Naira Margaryan was charged with a misdemeanor count of vehicular manslaughter for the death of Gerardo Ramos, who died 13 months after she ran a stop sign and struck his bicycle as he rode through a Glendale crosswalk. Infuriating cyclists in the middle of the city’s Bike Month, Glendale authorities assigned equal blame for the death on both parties; to make matters worse, a police spokesman incorrectly said that Ramos shared the blame because riding on a sidewalk is a violation of California vehicle codes. But as Damien Newton pointed out on Streetsblog, California delegates the decision on whether to allow or ban riding on the sidewalk to local jurisdictions — despite what the DMV’s Driver Handbook says. … (h) Operation of bicycles, and, as specified in Section 21114.5, electric carts by physically disabled persons, or persons 50 years of age or older, on the public sidewalks. As Dj Wheels pointed out, the intersection where Ramos was struck looks very residential. And that’s exactly the problem. Because section C of CVC 240 defines a business district as virtually anything that isn’t made up of exclusively of single family homes. (c) All churches, apartments, hotels, multiple dwelling houses, clubs, and public buildings, other than schools, shall be deemed to be business structures. 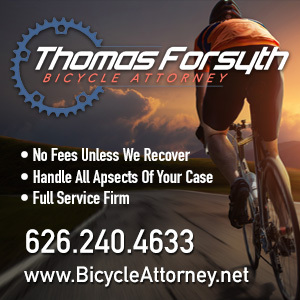 In other words, a definition so broad that it brings into question the enforceability of any ordinance based on it, since it would be almost impossible for a rider to know whether or not he could legally ride on the sidewalk in any given spot. What would be legal on one block might be illegal on the next — or even on different sections of the same block, as he rides past single family homes and apartment buildings, schools and churches. Whether or not that played a role in the decision to blame to Ramos for the collision that killed him has yet to be determined — as is whether anything can be done about it. 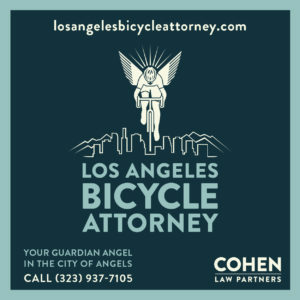 What is clear is that Glendale cyclists are stuck with a bad law that is almost impossible to obey; and that legal authorities continue to hold cyclists and drivers equality responsible for actions that contribute to collisions — even though careless drivers pose a risk to everyone around them, while even the most careless cyclists pose a risk predominantly to themselves. Meanwhile, master framebuilder Dave Moulton weighs in on the Gerardo Ramos case, noting that cyclists have to take responsibility for our own safety and stay off the sidewalk. Studies show there’s a significantly higher risk to bicyclists riding on the sidewalk compared to street — with or without bike lanes or other infrastructure. Another day, another fatal hit-and-run in LA; this one involving a pedestrian in Koreatown. Will Campbell proves himself a better man than I am by attending the Blessing of the Bicycles, and credits it to protecting him during a perfect unplanned sliding dismount; I let an hour long rush hour ride from the Westside in a cold, steady drizzle dissuade me. So if anyone knows any freelance bike-friendly priests, ministers and/or rabbis on the Westside, my bike is still in serious need of blessing. LAPD provides a podcast of Chief Beck’s Bike Week remarks. Green LA Girl continues her excellent coverage of Bike Week throughout the LA area. The Source calls attention to Wednesday’s Downtown L.A. Ride; better hurry, because it starts at 8 am. Stephen Box astutely looks forward to the day when Bike to Work Week won’t be necessary anymore. Bicycling offers a no-excuse guide to bike commuting, while UCLA Transportation provides a five minute video look at the same subject. Announcing a major victory for bike commuters timed for Bike Week, Metro plans to drop the rush hour ban on bikes on trains, replacing it with unlimited bikes in the articulated sections between cars, and releases a pretty new map of local bikeways, busways and train lines — though more street-level detail would help. And you can finish off the week by taking Metro to the L.A. stage of the Amgen Tour of California on Saturday; then again, you could just ride there. American Tyler Farrar wins his second stage in the Giro; Vinokourov keeps the leader’s maglia rosa. On the left edge of America, Dave Zabriskie wins Tuesday’s stage of the Amgen Tour of California and takes the overall lead; Brett Lancaster won yesterday’s rain soaked stage. On the political front, Claremont Cyclist endorses the LBVLA, while Damien takes an in-depth look at transportation issues in the 36th Congressional District. 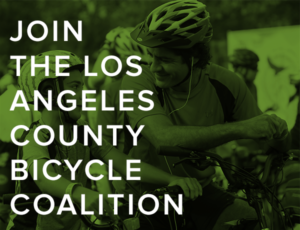 LACBC recruits cyclists to test ride LA’s soon-to-be-sharrowed streets; meanwhile, volunteers are wanted to make snowballs in…well, you get it. A UCLA survey question about biking and driving distances could have been phrased a lot better, and offered a better prize as well. LA Cycle Chic reports on a small but successful Mom’s Ride. Gary updates the state of cycling in semi-bike friendly Santa Monica, including a softening on bike licensing and the need for city agencies to work together; meanwhile, you’ll find more bike parking on the Promenade and throughout Downtown. George Wolfberg forwards a story from the NY Times about the ever-present fear of crashing among pro cyclists. Your word for the day: Aggromuter. An East Coast blogger asks if Boston is the new Portland; didn’t Long Beach already beat them to it? Tucson Bike Lawyer trades rings with a trike-riding toddler. A New Jersey cyclist barely avoids injury when she’s knocked off her bike by cups of ice thrown from a passing car; Texas high school students could have faced charges for assaulting cyclists with bananas. Springfield Cyclist celebrates the city’s newfound status as a bike-friendly community. Transport for London turns down an offer of help from the founder of 3FeetPlease; evidently, they have that rash of London cyclists killed by large trucks under control. Fashionable clothes, a toned bum and a tanned face equal cycle chic. Will 2010 be the Summer of Cycling? A Montreal paper says cyclists should be banned from regular roads because we’re all scofflaws — even though less than 20% ran red lights in their own study. And it wasn’t a cyclist who killed three riders in Quebec last week. Finally, Wednesday night marks the annual Ride of Silence honoring cyclists who have died on America’s streets. 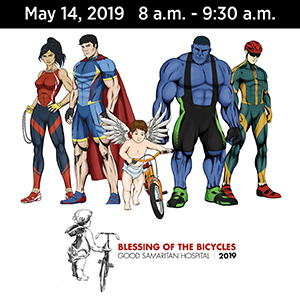 Memorial rides will take place in cities throughout the country; local events will take place in Santa Monica, Thousand Oaks, Valencia, Ventura, Rancho Cucamonga, Irvine and Temecula. I have other obligations, or I’d join the ride in Santa Monica, maybe someone can take my place. And lets make sure there’s a ride in Los Angeles next year.